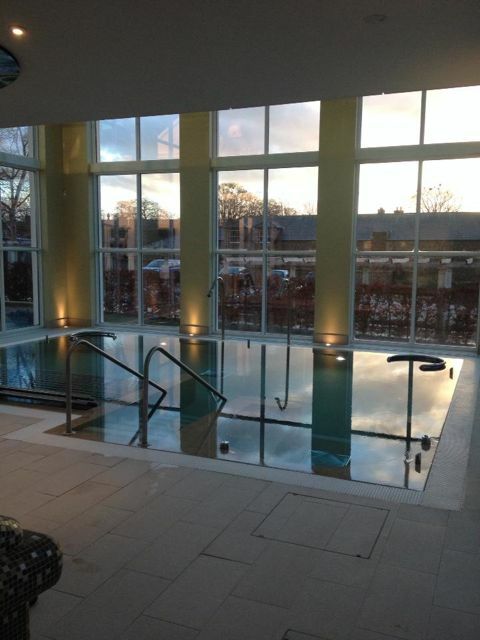 The Spa at Bedford Lodge Hotel in Newmarket opened in July 2013 and had slipped under my radar until a post-Christmas pampering session was in order and off I popped to sample a day of head to toe pampering for myself. 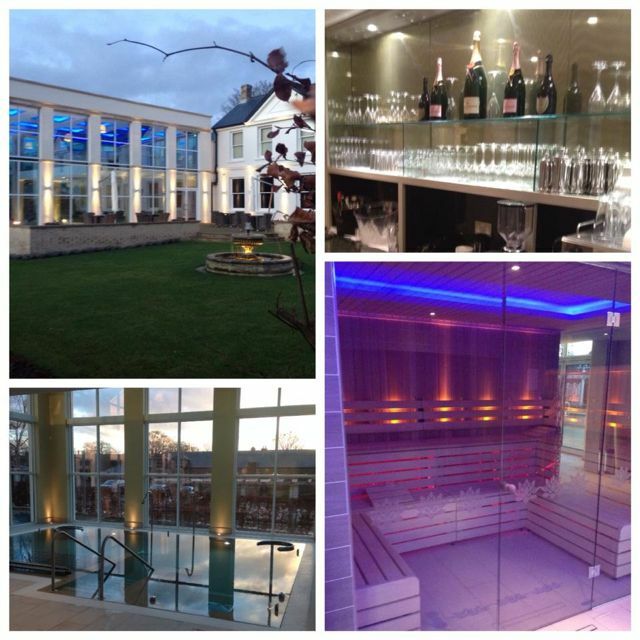 They offer everything from a day or evening spa through to a menu of full blown spa retreats and stays within this Georgian Grade II listed house adjacent to the main hotel. This is the perfect spa to be with a friend or two, perhaps even your partner for some time alone as a couple, or if you are like me and enjoy your own company from time to time, this is a fantastic place to curl up and feel comfortable reading a book and indulging in the treatments at your own leisurely pace. On my arrival, I was secretly pleased to see the Xmas tree and decorations were still up and wrapped around windowsills, fireplaces and large full length mirrors, it felt festive and I loved this, having not felt Christmassy until after our festivities this year – It felt very homely, as if I had just stepped into a large country house for a while. The girl at the front desk stood to greet me with a genuinely warm smile and proceeded to give me a very detailed tour after I had sat down for a few minutes to complete their short health questionnaire for my visit. She politely apologised as we went through, advising me that their main steam room was not working on this particular day (something technical, but I could see an engineer working hard to fix it, poor boy!) and she showed me a private room just off the poolside with it’s very own steam room for up to 2 people at a time, should I want to use it. It was great to have an alternative, rather than just a “sorry, but you have no steam room today” – fantastic customer service already and I hadn’t even broken out my swimsuit for it’s annual pilgrimage! I was assigned a key card for access between the spa facilities and the common areas & lounges as well as a locker key on a beaded bracelet, which was a very nice little touch – no tacky plastic key bracelets here. My locker (S18 to be precise) was stocked with a fluffy brown towel & a matching robe, with some good solid spa sandals that don’t allow you to slip – the little touches were all noted. The only thing I didn’t notice (I should have stopped to read, but I was too eager to get in the pool!) was the sign in my locker that told me to leave my robe and slippers in the locker at the end of the day… I put mine in with my towel into the shower area, oops! They might have thought I’d nicked mine, but I don’t have space for another bathrobe even if I had wanted one! 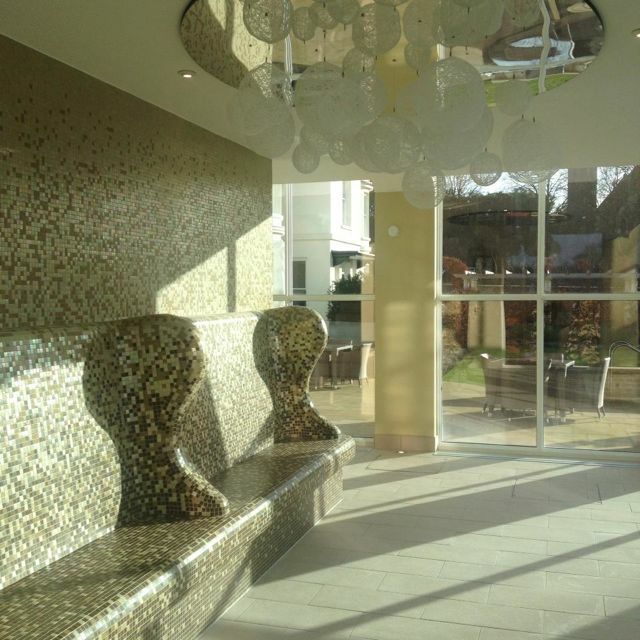 This is a well thought out spa with high ceilings, a very grand staircase and floor to ceiling windows which allows for plenty of natural light and in some areas you even feel as if you are outside – with the added benefit of staying warm inside of course. It houses a large sauna and steam room, outdoor rooftop hot tub (I lasted 2 minutes before realising it was too chilly on this particular day! ), beauty therapy rooms with adjoining relaxation room and also a couples treatment suite, a Hydrotherapy pool with 5 different water features (from a reflexology experience through to an all over body massage with high powered water jets) and experience showers. Next to the showers are an ice fountain and ice shower, which is a large wooden bucket of ice & water for the brave and strong! These were perfect to cool down with after a visit to the sauna, of which I managed a full 15 minutes inside before needing to leave in fear of melting into a puddle of post-xmas moosh. I was the first guest in, so I enjoyed a quick swim in pool – with a minor niggle being that you can’t really swim in it to exercise… this is a spa for relaxing only. Not something that I am used to doing well, I find it very difficult to chill out, so this was just what I needed, I had no choice and I am so glad of this as I did in fact relax. There is a gym over the other side of the courtyard at the hotel itself for a small fee, should you feel inclined to exercise whilst visiting. 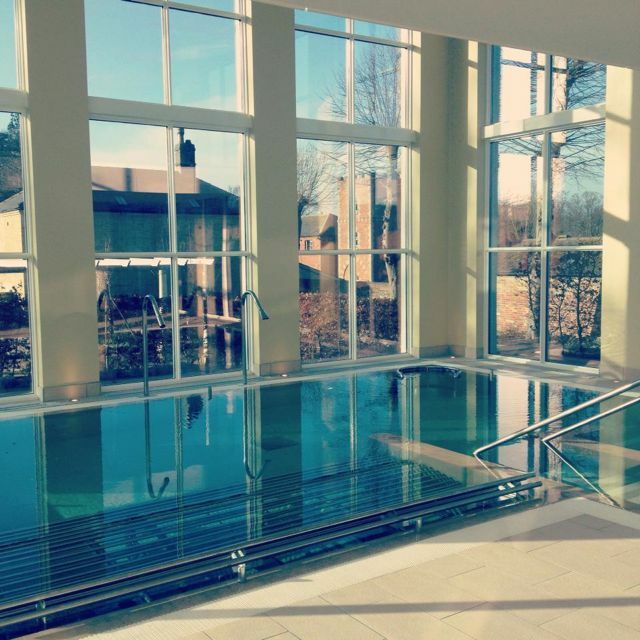 The pool has 5 different Hydrotherapy experiences to use, including a jacuzzi bath with jet stream bubbles, a body massage experience that you stand inside and cover yourself in bubbles, a reflexology chair within the pool to tickle your toes, a length of metal beds to lay in and enjoy light bubbles underneath you as well as 2 different waterfall fountains to massage your shoulders and back under – I used the latter to limber up before my massage, it felt amazing, nearly pushing me under the water as it pummeled my shoulders – bliss! Treatments are offered using product brands such as ESPA, Jessica & Lycon (for all your pain-free waxing needs!) 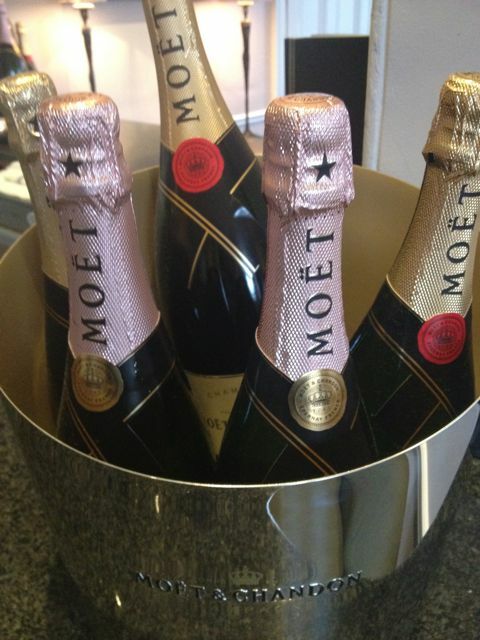 and you can even purchase your favourite products on departure from the main reception should you want to do so. There is no pressure to buy, but you are handed discreetly a little card with everything used during your treatment as you leave the therapy room so that you don’t forget which ones you enjoyed, a great little detail that I liked. You can choose from candle ritual treatments, massages, manicures & pedicures, facials, there are even treatments tailored for men. Whilst I was visiting there were 2 men in the spa as part of a couples package, which threw me, as each spa I have been to this year hasn’t seen any men in them with me, so it was refreshing to see this spa attracted the guys too. I can see why it would, it’s not over elaborate, very simple decor, personal and tranquil, I can’t say I bumped into any other spa guests most of the day, the team in fact stagger people’s visits so that you flow from treatments to lunch through to the spa without crowding each other – I’m mightily impressed. I waited for my therapist (Elisha) to collect me from the pool lounge, a mezzanine floor above the hydrotherapy pool with sun loungers and oversized sofas and she was ever so friendly, putting me at ease from the moment we made eye contact (I’m not very body confident when it comes to massage, so it’s important for me to feel comfortable in my therapists company or it breaks the relaxation for me). Elisha asked me to take a seat in the darkened treatment room and she allowed me to smell various oils on the backs of my hands to choose which I would prefer to be used on me, a real first in spa service for me. She also checked what pressure I would like for my full body massage (I went for a strong deep tissue massage to keep me moving with my personal trainer the following week) and she was AMAZING. I’m getting used to sports massage now, so sometimes a beauty therapist doesn’t quite cut it for a deep massage, but Elisha worked her magic and I didn’t hurt the next day, I felt fantastic. The hour went so fast, I think I may have drifted off once or twice thanks to the electric blanket underneath me keeping me warm as thunder and rain rolled on past and I even got a face full of steam and essential oils as I poked my head through the massage bed’s hole. Due to feeling fairly sleepy after my massage, I was offered a luxurious bed in the adjacent relaxation room. It’s a very dark room with oversized sofas surrounded by light curtains, lots of cushions and warm furry blankets to tuck under as you drift to relaxing music and sip on ice cold lemon water to keep hydrated – It was heaven. I was the only one in here and I snoozed for a good 45 mins before tip toeing downstairs for a bite to eat.. All this relaxing is hungry work don’t you know?! I want a relaxation room in my house, I know that much! There is a restaurant on site, of which is in fact more of a cosy fireside lounge, serving breakfast, light meals, coffee & sweet treats and even a full afternoon tea, should you so fancy. I went for a bowl of their “soup of the day” which was a creamy vegetable soup served with three different breads including a rosemary loaf and a deliciously creamy butter. The portions were large and superb value for money at £6.50, with friendly and discreet service, my waitress wasn’t over attentive of which I was pleased of, as I was sat in my robe and slippers. She allowed me to take my time and cleared my table promptly, offering something sweet, even if I couldn’t fit in another mouthful. The cutlery was placed at my table in a beautifully folded napkin envelope, a shape that made the napkin-folding geek in me smile, I do love a good napkin fold! There were 4 other guests in the restaurant at same time as myself and everybody spoke quietly, respecting the others around them, it was perfect for catching up on a few chapters of my book over some good food and the gentle background music was pleasant to listen to, but didn’t overwhelm the room – Edith Piaf came on at one point during my lunch and belted out “La Vie En Rose”, I was one happy bunny. There are books galore in this lounge area, many coffee table style books showing off luxury spas around the world and the large windows allow you to see the local jockeys trotting past whilst training their horses. “Changing room” actually doesn’t fit the luxury feeling you get from this spa, the dressing room feels like somewhere you wouldn’t mind spending some time getting dressed, again, a real first for me in a spa. The finer details might be small, but make it such a pleasure to be here, such as your locker key which is given to you on a bracelet.. so not only does it look great, but it stays on and isn’t a tacky plastic chain making marks around your wrist. There is a modesty screen to lock yourself behind to get dressed should you want it and the showers offer a rainfall shower head that I truly didn’t want to move away from, I could have stood there all day, using the complimentary ESPA shower and hair products within the cubicles to pamper myself one final time. Not only are there powerful hairdryers on offer in the ladies dressing room, but also GHD hair straighteners to allow yourself to look more than presentable prior to departing. I haven’t yet visited a spa that offers this (very welcomed!) addition to the mirrored table, what a fantastic touch for a girl with curly hair! Even after a shower I could still smell the essential oils from my massage and I was ready to head home and sleep some more on my sofa, seeing as it WAS a Friday evening – I didn’t feel guilty one bit! I was not expecting to feel as relaxed as I did, I arrived at 10:30am, had planned to be home by 3pm, however I was still curled up on a poolside sofa at 5pm, I really didn’t want to leave. 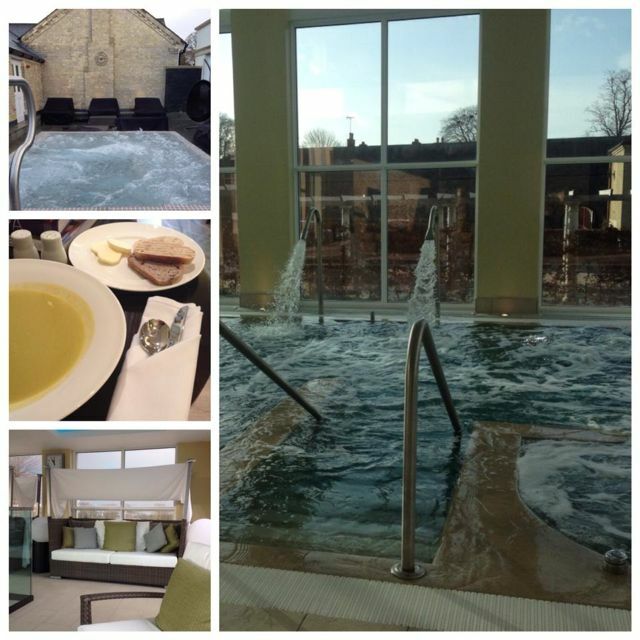 An annual pilgrimage to The Spa at Bedford Lodge Hotel is a must. I received a friendly telephone call the day before my visit to confirm that I would be joining them and to discuss my treatment choice for my package. They also offered me an apology in advance, as they feared the steam room may still be out of action on the day of my visit, so they wanted to ensure that this wasn’t a problem for me. If it had been, I have every faith in their service and I am pretty sure they would have let me change my day had I wanted to. Above the pool is a lounge area with canopied sofas & sun loungers with a refreshment bar of iced lemon water and complimentary magazines to help yourself to. It’s such a peaceful room and each lounger or sofa has a blanket and cushions to sink back into to allow for 40 winks. I have never been so relaxed in a spa before, I’m usually too busy earwigging into other conversations or treatments, but it’s very different to any spas I’ve previously visited. Unusual & unique light fixtures sit on every wall or ceiling of each room and area throughout the spa, so even when staring up at the sky you see the little touches. There are no real exercise opportunities. This is not a spa to exercise in, even if you hope to have a quick swim, the pool isn’t really big enough for doing so (I did try). However, saying this, it’s no bad thing as it means you have to relax 100%… and that really isn’t a terrible way to spend your visit! 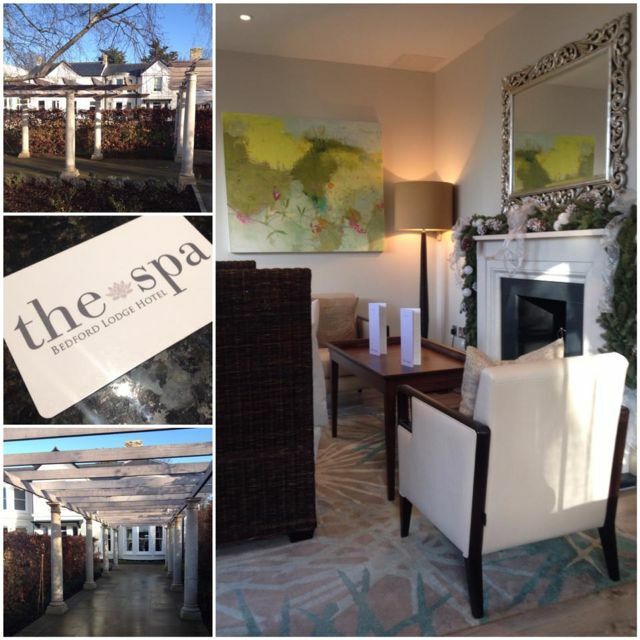 The package I enjoyed on this occasion was “The Winter Escape” at £85 which includes a 60 minute ESPA facial or massage and full use of the Hydrotherapy & Heat experiences. God that looks so good! Particularly like the post-massage relaxation room, what a treat. It was awesome, I didn’t want to leave and it’s right on my doorstep, so I need to get back there next time I’m feeling stressed out! oooooh – am going very soon – and now I’ve read your blog I literally CANNOT wait!! The place sounds just what the doctor has ordered. Only problem I can foresee is actually leaving…..